Red broadcloth lining has small pocket that closes w/ Velcro; perfect for keeping ID & debit card under your hat! If you look up "king" in the dictionary, there's a picture of a guy wearing this hat. in fact, the hat that guy is wearing isn't even this nice! But you get the idea. 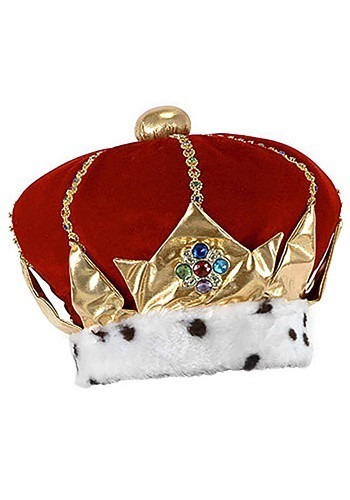 When people hear the words "king"... "regal"... "royal"... "monarch"... "your highness"... and "your majesty"... they think of someone wearing this beautiful, stately and ostentatious crown. That's why if you're looking to put together a truly classic king costume this Halloween, there is but one choice for your royal headwear: the Red Royal King Hat!